Thread: What can I except from a vintage Starfire? I really want a Starfire, have been wanting one for years, even when I didn't even know it yet. Traded a '62 P Bass that had been stripped but 100% original in beat up OHSC, a '65 SG Jr, 100% original P90 nastiness, and a '79 4 bolt Strat hardtail with "Deep Purple Metallic" paint done by yours truly, only took about ten tries to get it right... I got the flametop. He had a Red Starfire in the living room, I'd seen it before the last time I visited him, a 1968. I played it, like it but it wasn't on my radar. I think he wanted $650 for it? For some reason I never forgot that guitar. I still think about it... I held it, I played, I liked it, I left it. I finally found the 335 Dot (bucket list guitar) of my dreams some years back (translation, I'm bored with it), and it plays and sounds amazing, I just want a Guild. 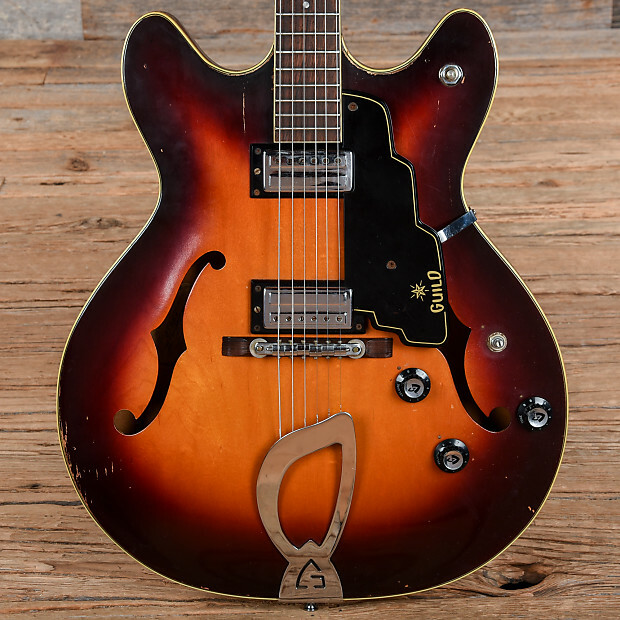 What can I except in terms of playability, sustain, etc, from a vintage Starfire. What years are the best years. The single cuts are deeper bodied and more like a ES175 derivative? How thick are the thick and thin ones? Do the p'ups rock out like a PAF, anywhere close? I won't put other p'ups in it. What about the bridge/tailpiece arrangement vs Gibson? 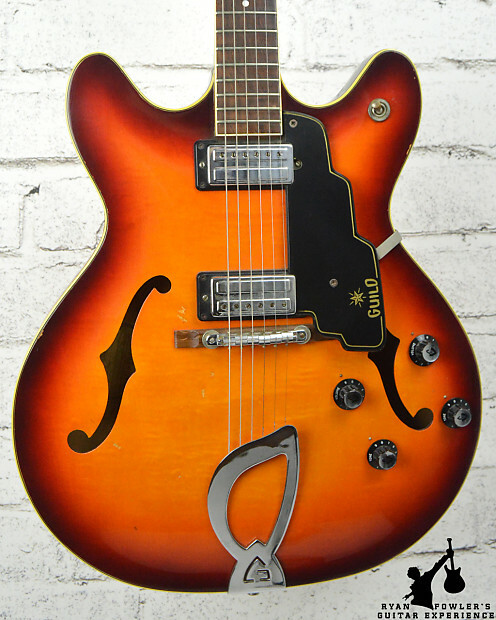 Or, the Bigsby option, I kinda like that idea anyway. What about action, fretboards and frets, common nut widths? Are they comparable to the Gibson neck/fretboard for wailing leads, or is just not that kind of a guitar? TIA for sharing any knowledge on these cool guitars. Last edited by Guildedagain; 03-21-2019 at 08:50 PM. Reading through GAD’s blog posts on Starfires will answer most of your questions, as well as increasing your GAS to a fever pitch. My exposure to SF’s is exactly 1, my ‘97 SF4. It is a fabulous guitar in every way. It feels like it was custom made for me. The SD-1 PU’s in this edition are really, really good. You can read about them in GAD’s blog. My SF is maple; if I come across another ‘97 in mahogany at a good price, I’ll swoop on it. My only quibble is the PU switch location; it’s a little awkward. I prefer either the 335 or the Les Paul locations. Certainly not a deal breaker, though. Necks might be narrower than Gibson, particularly up the fretboard, unless you're comparing to early-mid '70s 335s. Both small and large Guild humbuckers are pretty bright and articulate. I'm usually more of a single coil guy and they're both pretty close to my favorite humbuckers. Build quality is fine. They can be a little hefty, especially w/ a Bigsby. Um, what else? Thx ;-) Yeah nothing newer than '76 or '77 for me, it's a numerological or illogical thing... I tend to veer towards things from the early 70's, maybe because they're [probably] cheaper. They did make em in Maple in fact, in certain colors, like Green. Anybody here have early ones? Anti-hums & HB-1s both have nice high-end sparkle, even a bit of jangle, along with midrange oomph. In this respect they're not unlike PAFs (which tend to sound more like Tele bridge pickups than they do most other HBs) but with less snarl and more prrrrr to their sound. We need to know which model you're talking about. Regarding the Starfire IV there is one other thing to consider regarding early models. The 1963 to 1966 versions had a neck joint with the body at the 16th fret (S/N EL 800 still had it there) and in between 800 and 830 during 1966 it changed to the 18th fret (S/N EL 830 for instance was already 18th fret) so one had access to higher frets. This changes also where the pickups sit on the body. Both pictures are random from the internet for illustration: Compare the bridge and bridge pickup position to the bass side f-holes. The older model looks much more balanced, design wise. If you're used to a 16-fretter, the 18-fretters kinda "lean to the left*" a bit. Not unlike playing a Jazzmaster after playing a Tele.